Can I Eat Cold Meat And Smoked Foods During Pregnancy? Consumption of a well-balanced and nutritious food is a very essential component during pregnancy, as the would-be mother feeds herself and nourishes the baby too. Consumption of a well-balanced and nutritious food is a very essential component during pregnancy, as the would-be mother feeds herself and nourishes the baby too. There are many foods that need to be avoided or included on one’s menu, depending on their nutritious value on the health scale. 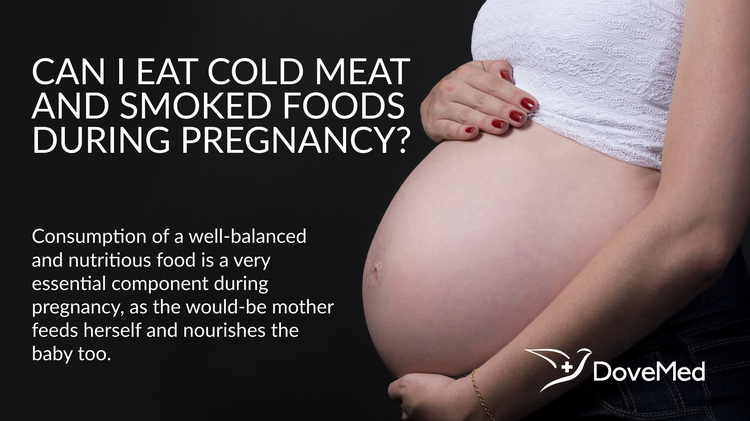 Cold meats and smoked foods are a favorite of many, but are they suitable during pregnancy? Cold meat, also known as deli meat refers to the cooked meat that have been sliced and prepared for light dining options. Most of the countries recommend that pregnant women avoid cold meat to prevent listeriosis, which is a food-borne illness that is caused by the bacteria called Listeria monocytogenes. The Food and Drug Administration (FDA) notes that every year around 2500 Americans become ill with listeriosis; of which up to one of five cases result in death. About one-third of this illness occurs during pregnancy. Not just the pregnant woman, but even the developing fetus is vulnerable to serious complications, which can at times even be fatal. Though the federal government is taking steps to prevent the exposure to listeria and they recommend that pregnant women avoid cold meats. The FDA has noted that Listeria monocytogenes grows slowly at refrigerator temperatures, and thus foods like cold cuts when placed in the refrigerator are at higher risk of summoning the infection. Food Safety Watch quotes that pregnant women have 20 times greater risk, when it comes to acquiring listeria than other healthy individuals. Smoking is the process of adding flavor to the food, cooking, or preserving the food by exposing it to smoke from burning material, which is most often wood. Consuming meat that is barbecued, which is grilled from smoking wood may cause health issues affecting the development of the fetus, according to a study cited in Nutrition. The research stated that women who ate smoked meat in the third trimester of their pregnancy gave birth to babies, who weighed an average of six ounces less than the mean weight. Also, ‘barbecue eating’ pregnant mothers had babies, who were shorter in length and had a smaller head circumference. However, study shows that having smoked seafood is generally acceptable, if it is in a casserole or forms part of other cooked dishes. It is advisable not to consume smoked or cold meats if you are pregnant. Instead, you may choose canned fish or fish that is heated to steaming hot. In some countries, deli meats are considered safe. But, a safe and wise course of action to afford protection to the mother and the child is to avoid deli meats until after pregnancy. However, it is always advised to consult your gynecologist or midwife regarding the consumption of foods that are safe and suit you and your developing fetus, during pregnancy. Athearn, P. N., Kendall, P. A., Schroeder, M., Bergmann, V., Chen, G., & Medeiros, L. C. (2004). Awareness and acceptance of current food safety recommendations during pregnancy. Maternal and child health journal, 8(3), 149-162. Kendall, P., Medeiros, L. C., Hillers, V., Chen, G., & Dimascola, S. (2003). Food handling behaviors of special importance for pregnant women, infants and young children, the elderly, and immune-compromised people. Journal of the American Dietetic Association, 103(12), 1646-1649.